If you are a huge hockey fan like me...GO HABS GO...please excuse me, I just had to blurt that out, then you're likely waiting with great anticipation for the upcoming release of EA SPORTS NHL 10 on Tuesday, September 15th. 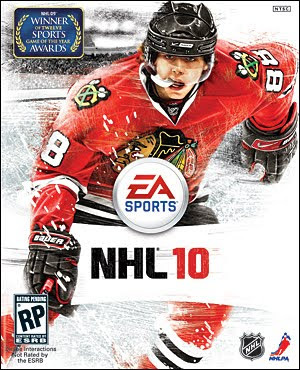 I loved last year's NHL 09 for it's slick gameplay, multitude of game modes and features like Be A Pro, a great online/multiplayer set up and just the overall package which was outstanding. This year's offering not only promises all of the great features from '09 but also adds new items such as board play and first-person fighting to enhance the game's realism. To celebrate the launch of NHL 10, EA SPORTS and Future Shop are teaming up for a Midnight Madness event in Toronto and Vancouver - two of Canada's hockey hotbeds. There will be launch parties held where fans will have the opportunity to play NHL 10 on the Xbox 360 before it is officially released as well as meet past and present hockey stars that include Wendel Clark (former Toronto Maple Leafs captain), Ian White (defenseman for the Toronto Maple Leafs) and Trevor Linden (recently retired Vancouver Canuck legend). Also at the events will be the Xbox 360 street teams to engage with fans and gamers. If you're looking to get NHL 10 and live in Toronto or Vancouver, then this sounds like a good reason to hang out, have fun and be one of the first people to get the game. What: Midnight Madness launch events celebrating the release of EA SPORTS NHL 10 at select Future Shop stores in Toronto and Vancouver. Stores are open from 12:00 a.m. to 1:00 a.m. It'b be very cool to attend if i was near TO on the 14th. Looking very forward to NHL 10. I'm hoping to make it out, it would be cool to get Wendel Clark's and Ian White's autographs.